NEW MLS search with Zillow links! Richard Howe's blog post, "Urban Rebels," provided a timely opportunity to use the 4th of July to update our rallying cry for a consumer revolution in real estate. Howe is Register of Deeds for the Middlesex North District in Massachusetts, and has written extensively about foreclosures and their impact on neighborhoods and communities. Excellent, timely post. With three million households behind on their mortgage payments, and a projected two million headed towards foreclosure, could the time finally be ripe for a consumer revolution in real estate? Collaborating with fellow real estate change agents, we hope to invite home buyers and sellers in Greater Boston to restart conversations begun 15 years ago at the “Consumer Revolution in Real Estate” at our experimental new location: One Broadway, Arlington, MA. We’ll experiment with seminars, real estate round tables, and web site demos. I’m particularly excited about reviving our Bubble Hours and hosting support groups for FSBOs & households facing foreclosure. Perhaps you can join us at an upcoming real estate unconference, or even present a topic / lead a discussion. How can we improve our money-saving Menu of Fees & Rebates? It's been more than a year since we updated our Menu of Fees & Rebates, so we'd like to invite home buyers to meet in person to discuss possible improvements. Our current options are shown above (click on arrowheads in outline for more detail) and on our wiki. Our most popular options include a 100% rebate of the buyer agency commission included in the sales price. Our hourly fees range from $75 to $125 per hour depending on the size of retainer prepaid (or $150 per hour with no retainer or minimum fee). Limited availability: Flat fees start at $3,000 plus performance bonus. Each performance bonus is negotiated individually to motivate us to help you maximize saving (see map of savings totaling over $1 million). We're also willing to work with a few buyers on a 1% fee option, some restrictions apply. Finally, you can propose your own fee / rebate, particularly if you are selling "for sale by owner" and would like us to represent you as a buyer. That way you can maximize savings both buying and selling. Our ideal is a mix of fees -- hourly, flat fees, and traditional. 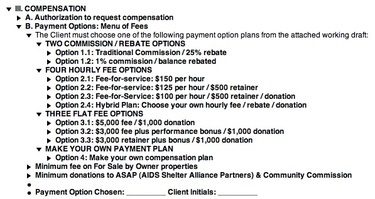 If you select option 3.3 and prepaid $3,000 in the next few days, we'll cut our hourly rate by 50% for the first 40 hours. We're pushing this special offer so we can attend the National Association of Realtors mid-year convention next week to identify the best new money-saving tools and trends for home buyers and sellers. Should we host a series of webinars or meetings off-line to discuss the benefits of each fee / rebate, and to help new clients decide which money-saving option best meets their needs? We can meet on short notice at a local cafe or in the privacy of your home. We're also eager to begin meeting at TogetherInMotion in Arlington, MA so working parents can talk over food while their kids play. Please contact us for additional information. To homeowners who are selling "for sale by owner" (FSBO). That's why we celebrated the Boston Marathon Monday by updating some buyer profiles from our 1,000 Click Club, a highly-motivated group of buyer clients who have viewed at least 1,000 pages on the MLS. If you're a seller who falls into either category above, we'd be glad to introduce you to our buyers. We assure you that our menu of fees are quite modest by comparison to traditional real estate commissions, and the potential savings are substantial. For example, one of the buyer / sellers matches we helped earlier this year will save approximately $80,000. We can't guarantee those kinds of savings, but if you're a seller who's struggling to get your home ready for the Spring market, we can offer you three hours of decluttering / organization / home staging for just $99 for three hours (limited offer). We'd also like to invite a limited number of sellers to attend one of our upcoming "for sale by owner" seminars, most likely in Arlington, MA or to schedule an in-home presentation. (One of our dreams is to teach 50 to 100 sellers how to save $1 million as a group. We passed that milestone for buyers during one recent 12 month period, see map of client savings). Will homebuyers create their own "Twitter posses"? "...our goal is to help seed a new generation of "embedded real estate reporters" or citizen journalists." A more pointed question, "Will mobloggers pop the real estate bubble?" followed on April 17, 2005, four months before the housing market peaked in Massachusetts and a year before we invited bubble bloggers and citizen journalists to contribute to our Real Estate Bubble Map. A potential home buyer could enlist a dozen or two dozen passionate, driven home buyers to serve as a kind of Twitter posse. Whenever she was about to tackle a big story or difficult interview, the home buyer could begin a mobile dialogue with fellow home buyers. What I like about the concept: It brings a much-needed air of transparency to the house hunting process. It expands the home buyer's field of vision. Combine that with interactive mapping, or add Twitter posts to our Real Estate Bubble Map, and consumers could create a powerful new way to share market insights by typing 140 character messages into their smart phones as they tour open houses, drive through new neighborhoods, etc. Admittedly, an ice cream truck in Boston during the winter sounds a bit misplaced, but that's why we're using the "off-season" to convert this near-vintage vehicle into a mobile mapping / podcasting studio. As we write a business plan and raise funds to repair the truck, we're looking for creative partners, special event proposals, and a place to park the truck. The vehicle is much traveled and much loved -- think of it as the "Velveteen Rabbit" of ice cream trucks. Some rust and needed repairs outside and in, but lots of makeover potential to become at least as appealing as this Hug Mobile. Sorry we've missed the opportunity to serve hot chocolate during college tail gating season, but we'll be ready next year. If things come together quickly, maybe we can do a "Homecoming Blitz" in time to cheer the Patriots from the playoffs to the Superbowl. If we're not ready in time for Christmas parties, the next marketing opportunity is Valentine's Day 2008. We've got lots of creative coop advertising ideas and invite yours as well. 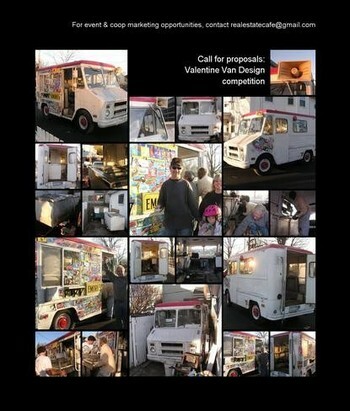 Anyone interested in sponsoring a design contest to turn this ice cream truck into a drive-by block party? Picnic-style Bubble Hour: "We're not in Kansas any more"
What a week on Wall Street! How soon will housing prices in Boston respond to the credit crunch? That's the subject we explored in our blog post last night that's already been visited by more than 400 readers. Many of them have come from a link on local favorite, BostonBubble.com, so we're inviting readers, Real Estate Cafe clients, and others to join us TONIGHT, Friday, August 17, 2007 for a picnic-style "Bubble Hour" at the Hatch Shell on Boston's Esplanade, just before the outdoor showing of the classic movie, "The Wizard of Oz." As always, Friday Flicks are FREE and start at sunset (approx. 7:30pm, we'll start gathering around 6:00pm so we can share insights into the falling housing market). If it is not obvious where we are, please call us. If you're a real estate professional, or just obsessed with money-saving real estate tools and toys, as we are at The Real Estate Cafe, join us for a real estate round table beforehand across the Charles River at MIT's Muddy Charles Pub (TENTATIVELY, approx. 4-6pm). Bring your laptop so we can surf some of the hot new sites featured at Real Estate Connect in San Francisco. We're also eager to begin brainstorming about the proposed real estate unconference this Fall in Boston. If it is easier for fellow real estate professionals to meet earlier in the day, or in another venue (or to postpone the technology debriefing until another date, please use this wiki-style event planner to "Talk about it." Will social networking make "negative cycle" more vicious? "There is a substantial risk that the mortgage market will devolve into a self-reinforcing negative cycle," Zandi said in a release this morning. "Mounting credit problems could beget more restrictive underwriting standards, which would weigh heavily on the fragile housing market as potential borrowers become unable to obtain credit, and existing borrowers facing large payment resets are unable to refinance. Foreclosures would mount, leading to weaker house prices, falling homeowners' equity and even more substantial credit problems. The cycle repeats with more intensity and the mortgage market corrections unravel into a crash." Thanks to the Boston.com's new real estate blog for posting the quote above. We discussed the same worse-case scenario yesterday with NECN, but used the word -- "vicious cycle" -- an economic term some might substitute for the "negative cycle" above. My question is whether social networking and unfiltered consumer access to real estate data make the downcycle more vicious?" Not through lack of civility, but data transparency that allows home buyers to make more informed decisions, putting further downward pressure on prices. To see what I mean, visit our new MLS access which allows users to easily compare asking prices to price trends and more on Zillow.com. Here's what we wrote two years ago about the coming negative cycle before Economy.com issued it's warning today: From froth to foreclosures: You ain't seen nothing yet!" When the market really cools, things will get worse, potentially much worse. A recent New York Times article called the magnitude of interest-only and adjustable rate mortgages "The Trillion-Dollar Bet" because "$1 trillion of the nation's mortgage debt - or about 12 percent of it - [will] switch to adjustable payments in 2007." Will foreclosures spike then? 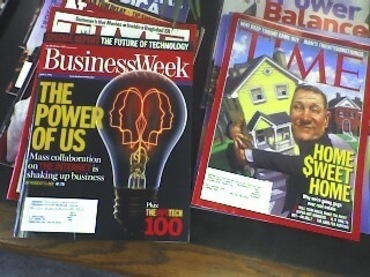 An upcoming article in the July / August 2005 issue of The Atlantic Monthly, entitled "Countdown to a Meltdown, speculates that the situation could become so bad that "repossession riots" will occur in some areas. Do you think that fictitious forecast is irresponsible fear mongering, or foreshadowing a falling market that will make current home buyers look foolish; or worse, candidates for foreclosure in the future? Cross-posted in the forum of The Real Estate Cafe's social networking site. Please join the discussion with other home buyers and sellers there. The unconference movement has spawned a nationwide series of self-defining BarCamps, which in turn, are spawning other events and informal user groups. 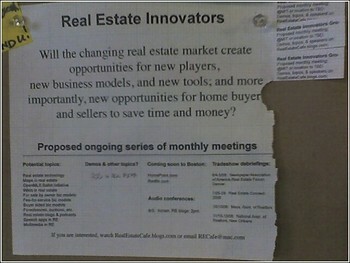 For example, a handful of attendees at BarCampBoston have formed an informal network of Real Estate Innovators and hope to meet monthly as the sign-up poster above suggests. If you're in Boston, join us tonight, Friday, June 23, 2006 at GeoMancers meeting at MIT to discuss what was hot at Where 2.0. (Email [email protected] or call 617-661-4046 for details, or to participate in future Real Estate Innovators gatherings in New England.) BostonPodCamp is tentatively proposed for later this summer, August 19-20th?, and BarCampManchester (NH) is also in the pipeline. Anyone interested in organizing a BarCamp in Yosemite or somewhere else in or near San Francisco for an open-ended unconference -- or a just a few conversations on hiking trails, around campfires, or in a bar -- AFTER Real Estate Connect SF 2006, July 26-28? For those who don't know, Connect is the leading real estate technology conference hosted annually by Inman News in San Francisco (that this blogger has missed only over the past decade). This is the first year they will be offering a Real Estate Software Developers Day. If you can't wait for that event, there is a BarCamp in San Francisco this weekend, June 23-25, 2006, and like all BarCamps, be prepared to bring your own session topic or demo. Can't make it to San Francisco? It's fun to watch who signs up for local BarCamps (see Boston example), and how related wikis and blog posts spring up before, during, and after the event. So keep an eye on BarCamp San Francisco for real estate related topics this weekend. Anyone interested in organizing real estate sessions at BarCampEarth, a "simultaneous compendium of Barcamps around the world to commemorate the one-year anniversary of the first-ever BarCamp" August 25-27, 2006? "When it becomes time to make ideas real, wiki lets us keep playing while we work. Wiki is how we turn discussion into documentation, rap-session into planning-session, and meeting into collaboration--online." Exciting to read that the innovative folks at RainCityGuide in Seattle, one of the best real estate blogs in the nation, are also experimenting with wikis; but it appears we may be approaching the collaborative power of wikis from different starting points. While RainCityGuide will be looking to fellow real estate professionals to collaborate on content, The Real Estate Cafe is looking to real estate consumers, both homebuyers and sellers. If you're wildly excited about wikis, maybe we'll see you here in Cambridge, Massachusetts for WikiMania 2006. Today (March 30, 2006) is the deadline for submitting a proposal to host a workshop or tutorial at this year's Wikimania. "Another idea I have is almost definitely ahead-of-its-time, but could be interesting, is that anyone selling a home is free to create a webpage that describes their home on the.raincityguide.com. It will cost you nothing but time, and if you are creative enough, it might get you some interesting publicity." FSBOSupportGroup.com members, let's create a FSBO resource center and coauthor a step-by-step knowledge-base and so thousands of people selling their own homes "for sale by owner" in Massachusetts can save money and save lives. 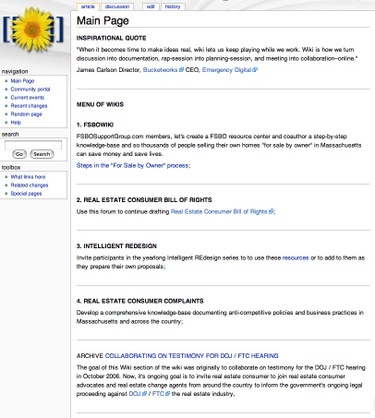 The goal of this Wiki section of the wiki was originally to collaborate on testimony for the DOJ / FTC hearing in October 2006. Now, it's ongoing goal is to invite real estate consumer to join real estate consumer advocates and real estate change agents from around the country to inform the government's ongoing legal proceeding against DOJ / FTC the real estate industry. New Year, New site for The Real Estate Cafe! WBUR/NPR debate: Do buyer agents really help consumers save money? What regulatory reforms are needed to protect real estate consumers? Peter Lake on $60 Billion question: How do consumers uncouple real estate commissions? Laith Salma Real Estat on Will real estate "consultants" replace real estate agents? RealEstateCafe on New Year, New site for The Real Estate Cafe! Fernley on New Year, New site for The Real Estate Cafe! Jeff Persons ABR on $60 Billion question: How do consumers uncouple real estate commissions? Maria Gudelis on New Year, New site for The Real Estate Cafe!